In my previous post we discussed about setup simple load balancer and how to make session affinity concepts. Multicast is To transmit a single message to a select group of recipients. here multicast used by tomcat cluster to identify the instances those part of cluster. In static cluster there is no need multicast, because each tomcat we statically defined/configured the other instances. But dynamic Cluster we are not defined anything. so each tomcat in that cluster some how to identify the other tomcat instances. so here multicast concepts is used. each and every tomcat first joining to single multicast group. and send the heartbeat signals in periodic interval. so other tomcat instances received these signal and add the member to the cluster. Session Manager is used to create and manage the session behalf the application. In Servlet Specification request.getSession(); line is mention that container (tomcat) is responsible for create the session. here tomcat use the Session Manager for this purpose. Its is the default manager used by tomcat. Even though we are not mention in our web application tomcat use this manager for managing our session. If u want to customize the this standard manager then add <Manager> tag in context.xml file. here org.apache.catalina.session.StandardManager is fully qualified class name of the Standard Manager. This mnager is to sote the session information into persistent place after some interval. here two types of store is available. JDBC Store helps to store the session information to relational database. so using the Persistent Manager we can achieve the tomcat cluster. but its not swapped out in real time. its pushes the information after certain interval. so if anything badly happen(crash) before that interval then in-memory session data is gone. In this post we are going to use this manager. Its replicate the session to all other instances. so this manager usually used clustered environment. but not good for large cluster. Add <Cluster> Entries in conf/server.xml file for all instances. In Linux Environment most of the system kernel is capable to process the multicast address. but we need to add route entry in kernel routing table. In multicast address is belong to Class D address Range (224.0.0.0 to 239.255.255.255). so we inform to kernel if any one access these address then it goes through eth0 interface. 2. Add <Cluster> Entries in conf/server.xml file for all instances. This very important part for tomcat clustering. We need to Add <Cluster> tag in conf/server.xml file in all tomcat instances. we can add this <Cluster> tag in either inside the<Engine> tag or <Host> tag. here most of the code are boiler plate code. just copy and paste. if we need we can customize. for example we can change the multicat address and port number. here Manager tag define the delta manager. Delta manager means replicate to all instances. Tomcat Clustering use the Apache Tribes communication framework. This group commnication framework is responsible for dynamic membership (using multicast) , send and receive the session delta information using uni-cast (normal TCP connection). This is Membership definition. here address is multicast address. we can pick any address from Class D address range (224.0.0.0 to 239.255.255.255)and any port number. Each and every tomcat send the heart beat signal to multicast address in periodic (frequency) interval. all other tomcat whose joined the multicast address they can receive these signals and add the membership to the cluster. if heat beat signal is not revive some particular interval (dropTime) from any one of the tomcat, then we need to consider that tomcat is failed. All tomcat instances which is part of the clustering, should have same multicast address and port number. here sender use the PooledParallelSender have pooled connections to use the send the session information concurrently. so its speedup the session replication process. here we define which port Receiver can bind and used for receiving the session replicate information. here two properties are important. address and port. here address is ur system IP address and port is any unused port. here address="auto" its automatically pick the system IP address. We need to make the our web application distribuable. its simple add <distributable/> tag in web.xml file. In according to servlet specification <distributable/> tag in web.xml mention that any container to consider this application can work in distributed environment. All session in our web application must me serializable. This is my configuration. all 3 tomcat instances are configured in delta manager and i deployed the distributed web application. all tomcat use the multicast to maintain the membership. then tomcat 1 is responsible to replicate the session using Apache tribes group communication framework to replicate the session to all instances. We used session affinity like previous post. based on that cookie id contain the tomcat name (worker name). so when first tomcat1 return the session id end with tomcat1. but when tomcat 1 is failed and tomcat 2 take the responsible for all further request. but session id still contain the tomcat1. 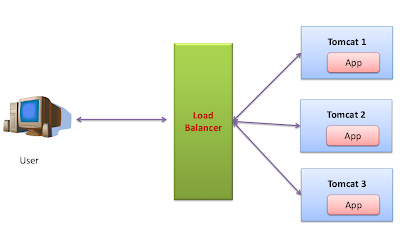 so its makes the load balancer difficult. because tomcat1 is down. 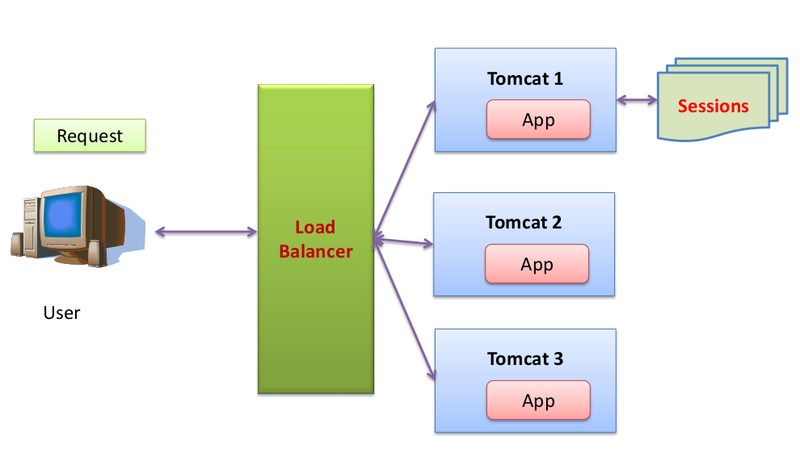 and load balancer pick any other tomcat. but actually tomcat2 takes the responsible. so we need to reflect these changes in session id. 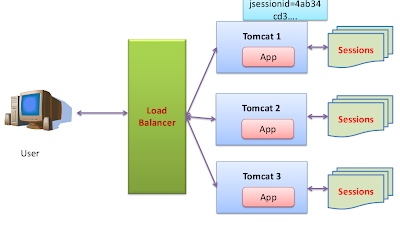 JvmRouteSessionIDBinderListener take care to change the client session id to tomcat2 when failure is occurred so load balancer redirect to tomcat2 without confusing.